Is This Tiny Biotech Still a Buy at All-Time Highs? 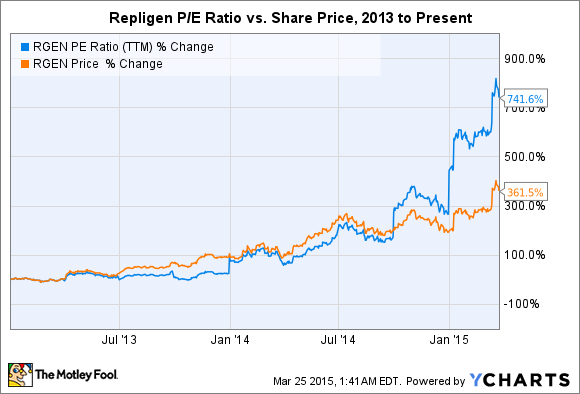 Repligen may not be on your watchlist, but it has been (very) good to investors in recent years. Will the ride continue? Does a soaring stock price mean investors should stay away or jump on the bandwagon? Well, it depends. Investors need to consider a multitude of factors, including financial metrics, growth rates, market opportunities, management style, competitive advantages, and much more. That level of analysis isn't always so easy. For instance, consider the tiny biotech Repligen (NASDAQ:RGEN). The company's stock has steadily risen since 2011 when it ditched risky drug development efforts to focus on supplying the biopharma industry with critical manufacturing components. In fact, shareholders have enjoyed a 60% gain in the first three months of 2015 alone! But Repligen stock now sits at all-time highs after being undervalued, underappreciated, and misunderstood (what the heck is bioprocessing anyway?) just a few short years ago. While the addressable market opportunity provides plenty of room for growth, the company boasts a price-to-earnings ratio of 125. So, is Repligen stock still a buy at all-time highs? Let's dig deeper to develop a more informed opinion. Growth factors: Used in manufacturing (fermentation) to increase the production of monoclonal antibodies (biologic drugs). Repligen markets and distributes these products through a long-term distribution agreement with Sigma-Aldrich. Protein A: Used in the purification of monoclonal antibodies -- the most important and costly step. Repligen is the world's leading manufacturer of Protein A and has long-term supply agreements in place with General Electric Healthcare and Merck, among others. OPUS Series chromatography columns: Chromatography columns are the vessel in which purification is completed. The company offers columns that are shipped to customers ready for use, and can be disposed of after a single use, saving the customer costs related to storage, cleaning, and construction. Alternating Tangential Flow (ATF) System: Despite the fancy name, this is essentially a high-level filtration system that increases the number of cells in a manufacturing process. The more cells present, the more product can be made in a single production run. The ATF System was acquired in 2014 and is now manufactured at Repligen's flagship manufacturing site after an expansion project was completed in December. Supplying these critical components to the biopharma industry allows Repligen to generate predictable, high-margin revenue year after year. Strategic pursuit of easily accessible and complimentary market opportunities has led to rather predictable growth for the company, too. It's one of the primary reasons the bioprocessor has been considered such an attractive investment. But there's plenty of room left to run. Repligen gets to piggyback on the wave of biologic drug development and approvals (monoclonal antibody therapeutics specifically), which has been and will continue to be the undisputed driver of growth. In 2013, global sales of monoclonal antibody therapeutics surpassed $70 billion for the first time -- continuing a trend that shows no sign of slowing anytime soon. As of last year, there were more than 40 monoclonal drugs on the market and more than 350 in development across the biopharma industry's pipeline. There were six monoclonal antibody therapeutics approved in 2014 -- the most ever in a single year -- and Repligen expects fourteen additional approvals in 2015 and 2016. Nearly all are made using products manufactured and supplied by the company. Breaking down the opportunities for specific product portfolios is more difficult, but management has provided ballpark estimates in the past. Growth factors are estimated to have an annual market opportunity of $50 million to $75 million for industrial applications, while additional uses could push the opportunity over $100 million. Meanwhile, the company believes a $100 million opportunity exists for its smaller OPUS Series chromatography columns. But after releasing the largest single-use column available on the market in 2014 -- and with an even larger column on the way in 2015 -- the opportunity for commercial applications could be much larger. To put the growth and market opportunities in perspective, consider that total product revenue was $60.4 million in 2014. That's expected to climb to $72 million to $75 million this year, and it's easy to see that Repligen is far from exhausting growth avenues. Yeah, but what about that (very high) P/E? There appears to be no shortage of opportunities, although it could be difficult to ignore those pesky financial metrics investors are always hearing about. Repligen sports a market cap of $1 billion and a P/E of 125, which is supported by product sales of $60.4 million, operating income of $10.7 million, and net income of $8.2 million. Those figures are expected to grow handsomely in 2015 to (using the high end of guidance for each) $75 million in product revenue, $14 million in operating income, and $10 million in net income. The growth is impressive, but does it warrant such a hefty market cap? On one hand, it's not as if Repligen is barely profitable. Product gross margin was 53% in 2014 and is expected to climb even higher this year. Historically low overhead (just $23 million of combined R&D and selling, general, and administrative expenses in 2014) means the company will be comfortably profitable as it grows. Investors also have to consider the company's strong balance sheet and management's successful trigger-happy attitude (all current products were the result of past acquisitions). On the other hand, investors have to consider the possibility that Repligen stock is overpriced. After considering the growing gap between P/E and stock price, that isn't difficult. One of the company's key selling points -- that it doesn't pursue risky drug development -- may also support the argument that Repligen is well overvalued. After all, the potential for blockbuster assets drives wild valuations for small biopharma companies, justified or not. But there is no therapeutic pipeline or potential home run drug candidate that could one day generate billions in annual sales for Repligen. That could hint that the stock price needs to be adjusted eventually, especially if investor appetite for biopharma stocks, currently at all-time highs, subsides. Is Repligen still a buy? In the absence of potential clinical stage therapeutic assets, perhaps it makes more sense for Repligen's market cap to more closely mirror the value of its manufacturing assets and prowess. The company's total assets registered at just $128 million at the end of 2014, which leads us to the next question: How much is its technical know-how and leadership worth? I certainly don't have a concrete numerical answer, but given how well management has executed on its strategy, it just may be worth every penny. Add in 10 years worth of double-digit growth and the pharmaceutical industry's infatuation with biologic drugs, and Repligen may turn out to be a steal. If you can stomach volatility and acknowledge the possibility that the stock may be grossly overvalued today (and may be adjusted lower in the near future) in the hopes of capturing growth in the long term, then Repligen stock might deserve a spot in your portfolio.